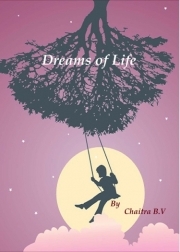 Description of "Dreams of Life"
This book is a result of my experiences of ‘LIFE’. Each poem contains a lesson, one should learn from life. A desire can be successfully fulfilled only if, it was dreamt earlier. In the pages of this book, I have penned my thoughts in such a way that one should be able to put their mind into it and remember the day when a similar incident was witnessed. Life is easier to be imagined and targeted. Like wise, facing and living it is easier only when the mind is installed in it. I expect these poems to bring a smile on the reader’s face, on its completion. Relating yourself to the dreams and realities, I’ve found and put forth in this book, should condition you to read them again and again. Ms Chaitra B.V is born on 17-06-1986. She is working as a web developer in Induscorp India Pvt Ltd, Bangalore, after having completed the bachelor's degree in Computer Applications. Her hobbies are singing, composing songs, composing tunes, writing articles in English and Kannada, and writing poems. Passionate towards singing, since childhood, she's competed in school level and inter-school and inter-college singing competitions and has won prizes. This is her first poetry book and first ever book to have published. Reviews of "Dreams of Life"